Ice cubes in plastic bags (2,5 Kg or 5 kg) from Djib’Ice Ltd are the perfect ingredient for your festivities, barbecues, birthday parties… The freshness in the pure state ! 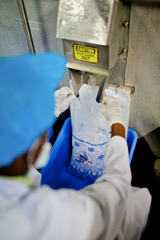 Ice cubes must reach the highest standards of quality and safety to be potable. Friendly and convenient our ice cubes are a must for a perfect serve. Ice cubes are made from water filtered by latest reverse osmosis technology. The shape is cylindrical with a size of 1,25 inch to fit perfectly in your glass. TO reach the food safety standards, the water is passing through the following process : active carbon filters, softeners, reverse osmosis filtration and UV filter. The packaging process prevent any contamination of the product. Crushed ice : The ice cube is perfect to put in the glass and the crushed ice will help cooling down your beverages from outside. ADAPTED to the size of your ice boxes, crushed ice will be very efficient to keep cold all your bottles. 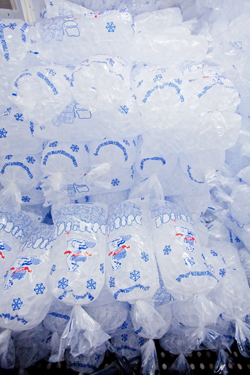 Packaging : – Ice cubes are available in two size bags : 2,5 kg (approx 75 cubes) and 5 kg (approx 150 cubes). We will contact you as soon as possible, get it delivered to your home ice.